I’m a dreamer. I add things & places to my Bucket List probably everyday. Some are feasible, some are a stretch, and others are a little bit ridiculous! Something exciting about this year, is I get to cross off at least one of those from my list. Here are three places I would like to visit in 2015. (I cheated a bit because one of the places I went to about two months ago, another place I will probably visit this year, and the third is probably not going to happen yet). While in Zimbabwe, we will most definitely be going to Victoria Falls! There are hiking trails, natural pools to swim in, bungee jumping, helicopter rides, and wild animals. Not sure how adventurous we’ll get (though I’ve always wanted to try bungee jumping)! Back in late February, Kameron & I took a mini-vacation to Savannah, GA.
Savannah had been on my bucket list since I was a little girl in Girl Scouts. If you did not know, the founder of Girl Scouts, Juliette Lowe, was born in Savannah. After researching Juliet for a big research project in 5th grade, (where we had to dress up like the subject of our project & answer questions to all of the students’ parents) I had dreams of the lush Savannah trees & pre-Civil War era plantation houses. What a magical place Savannah was in my dreams. & what a magical place Savannah is in real life! After our trip we posted a few articles: How We Spent Two Rainy Days in Savannah, 5 Things To Do When Visiting Savannah, 5 Things We Wish We Did in Savannah, & Tybee Island Lighthouse. What do you picture when you think about Ireland? Nothing but rolling green hills, beautiful rocky cliffs, and quaint little pubs where the community is warm & welcoming. Doesn’t everyone picture that? My family still has relatives that live on a farmstead in the countryside of Ireland. I would love to surprise them at the gate of their home, listen to old Irish tales & stories of the Doyle clan, while eating a big plate of corned beef and cabbage. Now it’s your turn! 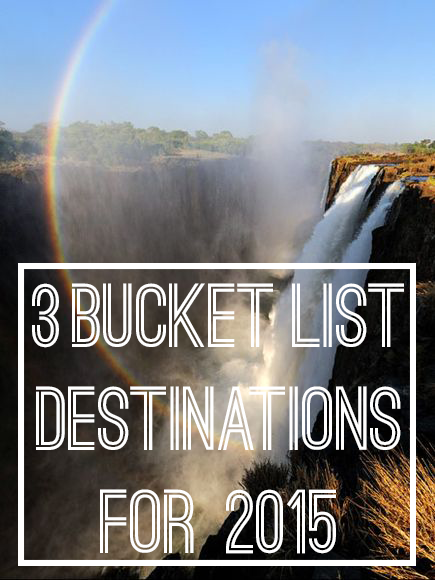 What are three destinations on your bucket list for this year? Leave your answers in the comment sections, or go ahead & write your own blog post about it, and be sure to share the link with us! This post was written as an entry in a giveaway on the blog Girl Vs. Globe. The prize is a fantastic trip for two to Finland or Sweden to see the northern lights, with full board accommodation, return flights, a husky safari, a visit to a reindeer camp, a snowmobile ride and much more, provided by the host Transun. Although the prompt was provided, all thoughts & opinions are my own. I am so jealous you are going to go to Victoria Falls! Such a beautiful place, definitely on my destination wish list. Jacob and I really want to explore the North Shore this summer and take a trip out to Colorado (even though we have been there many times before). I can't wait to go to Victoria Falls. I went to Zim almost 6 years ago & didn't get to see the Falls. --- Isn't it great that you have a special place where you like to explore over & over again. Colorado is SO beautiful! Where do you usually go? Love it! I am just like you... adding places to my bucket list everyday! Haha, hopefully I get to all of them sooner rather than later! Savannah sounds amazing... I had forgotten about that bit of girl scout history! My mama started me on a tradition very young of always visiting the girl scout house when on vacation... we even hit the one in London when we were visiting! Ireland is definitely on our list as well... hope you make it there! I found your post on the Peony Project. I love to travel and hope to visit Ireland, Tokyo, and London this year. I traveled to the UK several years ago and can't wait to return. I also love Savannah, GA. I recommend taking a cooking class at 700 Kitchen School. I also love Back in the Day Bakery. I found you at Peony's! It's funny because I was just thinking about bucket lists the other day and how I've never made one. I hope you get to travel to all 3 places soon! !